Gardening can be an enjoyable medium for supporting physical, social and emotional health. In addition gardening can also provide education and training opportunities, not only horticulture skills but life skills, literacy and numeracy. We uses gardening to bring about positive changes in the lives of people living with disabilities or ill health, or who are isolated, disadvantaged or vulnerable. This is known as social and therapeutic horticulture – the process of working with plants to improve physical and psychological health, and communication and thinking skills. It is also uses the garden as a safe and secure environment in which to develop an individual’s ability to socialise, make friends, and gain practical skills that make them more independent and self-reliant. “…… the process by which individuals may develop well-being using plants and horticulture. 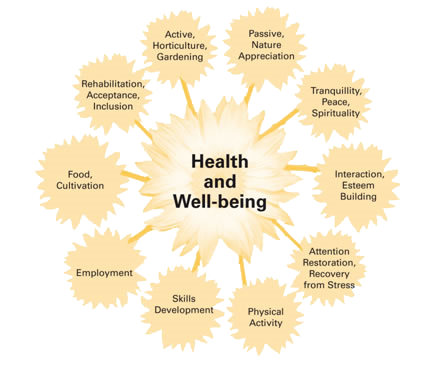 This is achieved through active or passive involvement.” – Journal of Social & Therapeutic Horticulture, 1999. Gardening can help individuals accomplish many things. It can help rebuild a person’s strength after an accident or illness, and can provide a purposeful activity for someone coping with a difficult period in their life. It can lift moods and help people to connect with others, reducing isolation by forming friendships and improve communications skills. Using gardening tasks and the environment we build a set of activities for each gardener aimed at improving their health and wellbeing and achieving particular goals identified by the gardener themselves or by their family, support workers or carers. Gardens offer the peace and tranquillity needed for rehabilitation and recovery. And, being given the opportunity to develop an interest in gardening will give benefits that can last a life time.